Over the Christmas holidays, I ran into an acquaintance from Brooklyn in the lodge at Hunter Mountain. He was bemoaning the cost of skiing: it had set him back $300 to get his family of four onto the mountain that day, and that was not counting the cost of gas, food and other extras. That was, I agreed, a lot of money. In fact, it was about half the entire budget I’ve allocated for Campbell and myself this year. When I asked if he’d booked in advance, taken up any online offers, picked up a frequent user card, any of the kind of things our family engages in to save dollars on this greatest of sports, he admitted that no, he had not; he had simply loaded the family in the car, driven to the mountain and paid the asking price – in the middle of a holiday week, no less. His thoughts have been with me of late, given that our local ski mountains are enjoying the greatest conditions since we started coming up here in 2002-03 and yet we’re all in the worst financial crisis in a lifetime. The Catskill Mountains (over) depend on tourist dollars, which makes it beholden on those of us who live here to invite people up to enjoy them in winter (as well as summer). But because we’re in a recession that threatens to become a depression, and experiences like that of my well-intentioned friend contribute to the belief that skiing is a rich man’s sport, it’s equally incumbent on those of us who love to ski and ride to share some of our tips for doing it on the cheap. With so much snow on our four local mountains this year, I’m sure they’ll all be open well into April (Belleayre, which had a cut in State funding this season, was originally scheduled to close at the end of March, and is now hoping to extend that date due to the great conditions), so you’ve still got plenty time to take up these suggestions. And if you don’t, file them away until next year. Skiing, snowboarding and associated activities are not the domain of playboys – especially when you compare the cost to seats for a major spectator spot. No, they’re within the realm of us all – even in a recession. These tips are tailored to the Catskill Mountains, but they can be adapted to almost any area anywhere. You just need to be creative. Determined. And, above all, enthusiastic. See you on the mountains. I always imagined I’d take my son to the football on winter weekend afternoons… Not only do I prefer spending my money on mountain sports instead, but I suspect that it’s cheaper. Campbell at the top of Belleayre. Three years ago, I was fortunate enough to have the cash to take Campbell and myself on a dream trip to Utah. It was, quite possibly, the greatest holiday of my life. The snow in Utah is like nowhere else, though I suspect I would have had an equally great time in Colorado, California, New Mexico, British Columbia or anywhere else in the Rockies; after all, everyone knows that the best skiing is to be found in the highest mountains with the greatest snowfall. (Hello, the Alps!) But nobody in their right mind wants to risk that kind of expense right now, even if they do (still) have the money in the bank. The good news is, you don’t have to. The vast majority of Americans on the east coast of America, as far south as Virginia – a combined population that runs in the tens upon tens of millions – are within a day trip’s drive of a ski mountain. So are the majority of Americans on the northwest coast. And those in Canada. And Denver and Salt Lake City and other major urban areas besides. Hey, the mountains in New Jersey and Pennsylvania may not be the greatest in the world, but they’re yours. Use them. Of the four Ski Mountains in the Catskills, Hunter and Plattekill are family owned, Belleayre is state-owned and only Windham is part of a major corporation. All of them employ local people, many of whom depend on the work every winter. So, keep your money in your community; it will come back to you, I promise, in more ways than you can imagine. Yes, it’s time to be like your parents and get organized. It’s never too early to plan your next season’s skiing. I planned my current winter in March of last year, when Hunter Mountain released its Midweek Season Pass for all of $199. Buying it that early, at that price, has allowed me onto the mountain almost any weekday this season – except for public holidays and the week between Christmas and New Year – for what I now justify as zero dollars. Zilch. Nada. Nothing. When the powder hits, I can take a snow day. When the sun comes out and I’m in the mood, I can hit the mountain for a couple of hours first thing and still be at my desk by 11am. (Alright, by midday.) Most weekdays, there seems to be nobody else on Hunter Mountain – except for all the other people with a Midweek Season Pass, every one of whom agrees, on the chair lift conversations that we all so enjoy, that it’s the greatest deal out there. By using my pass once a week on average for the full 20 weeks, I can bring the cost of my skiing down to just $10 a visit. At that price, it’s hard to imagine another sport so inexpensive. 3)	Buy a Frequent Skier Card. 4)	Sign up for newsletters. The worst they can do is crowd your Inbox. The best they can do is save you money. The weekly newsletters routinely include some kind of discount, and even if they’re not exclusive to online customers, at least they let you know about offers you might otherwise struggle to hear. This weekend, there are good deals in the name of good causes. Bring in three (3) non-perishable items to Hunter this Saturday February 28 (you don’t even need to buy a ticket) and get $20 off a subsequent lift ticket. Donate $10 to the Helen Hayes Hospital at Belleayre this Sunday, and your lift ticket is $25 instead of $54. And don’t forget Liftopia.com which, in the middle of my writing this late on a Thursday, sent through its weekly e-mail announcing its discount tickets for the weekend, including both Saturday and Sunday at Plattekill for $34, a hefty 32% savings and in fact a great deal given the mountain’s current blanket of snow. 5)	Sign up for local programs. Belleayre has a Shandaken Program, whereby residents of its local town (which includes the villages of Phoenicia and our own Mount Tremper) get to ski every Sunday for $20 – and that includes a free lesson. That offer is absolutely unbeatable, but before you get too jealous, know that it allows us to bring friends along for just $25; I’m suprised I don’t have more house guests. Hunter, meanwhile, invites residents of all the local counties – Greene, Ulster, Albany, Delaware, Schoharie, Rensselaer and Columbia, a fair old population base that includes the cities of Albany and Kingston – onto the mountain on Tuesdays for just $25. That’s got to be worth taking a day off work for, at least once a season if not even once a month. I’m not sure if Windham has a similar program, but it should. It’s always worth calling to ask. < Most days, on most mountains, the little ones ski for free. No wonder Noel is smiling. 6)	Come up on festival week. The last week of January each year in western Ulster County is Winter Festival Week, the idea being that each local hamlet celebrates on a different day in a different way. It’s a hard task to pull off, given the weather and the sparse population, but Belleayre gets into the swing of things with ludicrously cheap tickets all week long. Last year they were just $15; this year, due to a cut in their State funding, they had to increase the price – to all of $20. (Oh, the misery!) 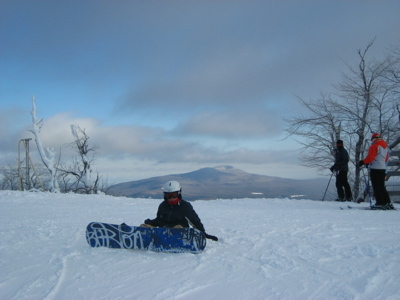 Plattekill Mountain, the snow secret of the Catskills, thirty minutes north-west of Belleayre, which is typically only open on Friday of the weekdays, opened on the Wednesday and Thursday of that week too, offering $15 tickets each day. While I usually spend my weekdays on Hunter, given that it’s “free” with my pass, I took advantage of that last Friday in January, when Plattekill had received a bunch of fresh snow. I had to walk all of fifty yards from car park to lodge, never had to wait more than one minute for the lifts that are right outside the lodge, ski’d powder and corduroy all day long, and was able to put my feet up in front of the lodge’s central fireplace at the end of it. And all for $15. They exist. Just call the mountains or look on their web sites. 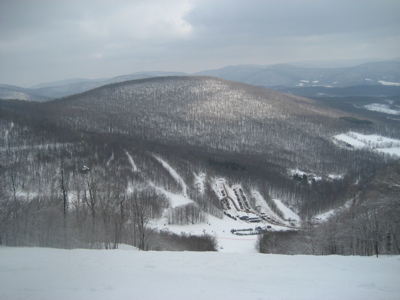 Next Friday March 6 at Plattekill, for example, the first 100 people get on the mountain for $15. Friday March 13, at Belleayre, it’s $25 all day. Belleayre also offers a “Ski free on your birthday” incentive which I totally forgot about this year; my April birthday would have allowed me to ski free that day in December which, considering it fell in the middle of the peak-price Christmas holidays, would have been a bonus gift. Damn. Guess I’d best just remember that one for next year. 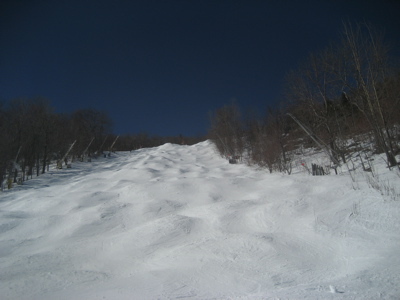 Hunter Mountain’s Lower K27 viewed from below. The only way to take a picture is to get down the run first. I was living up here for two years before I heard that Potter Brothers offers “flex tickets” at ludicrously low prices. A quick look at their web site reveals a Belleayre ticket for $23.95, a Windham one for $28.95, and similarly low prices for mountains as far away as Jiminy Peak. The tickets are tied in to specific days, but include many Sundays. (Take advantage of that: Saturdays are over crowded as it is.) Potter Brothers has several stores in the region, including one just off of Exit 19 on the Thruway, on the way towards Belleayre and Plattekill; if you’re going as far as Hunter or Windham, you can scoot off at that exit and be back on the Thruway in probably just fifteen minutes. A couple of years ago Hunter launched an ESki service at its web site, which, for those who have yet to seize on any other offer, still gets you a significant 15% discount on the price of lift tickets, rentals and lessons. You have to book at least two days in advance, but that seems a small commitment, especially given that I have not seen similar offers at the other mountains. Only when it’s justified of course. We had a school’s-out-snow-day in late January and I took Campbell onto a Hunter that was proclaiming perfect conditions on its web site. I got on for “free” with my pass; with his Big Lift Ticket, he got on for $24. But the snow turned to rain, heavy winds kicked in and the lifts to the mountain’s exposed peak were closed down. We got our share of runs in but still, to use a snowboarder’s turn of phrase, that sucked a big one. Word soon went round that a quick visit to the office would garner a $20 voucher for a future trip. For those of us who know we’re coming back, that’s nothing to complain about. If you get my drift. Every morning, without fail, buses leave New York City to take eager, up-at-dawn skiers and riders out to the Catskills and home again in time for dinner. An example: Paragon Sports, at Union Square, offers bus ride, lift ticket, breakfast and movies for $79.50. (Plus, of course, they pay for the gas.) If you have a way to get on the mountain for less than $40, buy the bus ride alone for just $39.50. That’s quite the deal. The only drawback? You have to be there at 6am. Hey, you can always put your earplugs in and get a couple more hours shut-eye before you hit the mountain. “The Plunge” at Plattekill is aptly named. An 1100ft vertical that taxes even the most well-honed of thighs. You don’t have the $1000+ dollars to take a week out west, but nor do you fancy driving home after your hard day on the slopes (and your hard après-ski drinking). Know that every one of our local mountains has package deals with local hotels, B&Bs and lodges. (And I know from experience that it’s the same in Utah.) Midweek ski and stay packages at Belleayre lodgings start from $49 a person (based on double occupancy); Windham offers its very cozy Winwood Inn during midweek for $79 a person, and $148 at weekends; Hunter’s new lift-side Kaatskill Mountain Club, complete with outdoor hot tub and pool within a stone’s throw of the quad lift, is available from $99 a person. 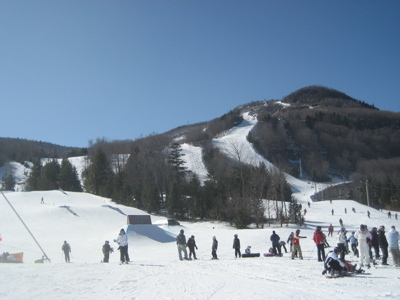 As for that mom-and-pop mountain, Plattekill, its lodging incentives include free Sunday skiing (after a full price Saturday, of course) or one under-17 free for each fully paid adult. Plattekill’s nearest village, Roxbury, also happens to house the sexiest hotel in the region: the Roxbury. Posie and I are trying to figure how we can get to it for a night out, preferably while the ski season is still in swing – and, ideally, without the kids. This is why hotels skip the thirteenth floor. Because sometimes you just have to go for it. I’ve been riding these bargains to their limit all season long, determined to prove that my family can get maximum use out of our local mountains for minimum dollar. But when the weekend of February 21st loomed and we were set to attend the Melody reunion in New Jersey, right as Plattekill Mountain, with its unique Great Lakes snow effect, got dumped with almost two feet of snow while nearby Hunter and Belleayre both languished with just a few inches each, there was nothing for it but to get up early, drive out to Plattekill, and pay full price. (Noel, bless him, being a toddler, still got on the mountain for free.) Campbell had an early meltdown about my devoting the best powder day of the year to his younger brother, who I was following down the mountain courtesy of a newly donated harness, him screaming with terror the whole way but happily going up the lift again for further rides. Yet it turned into the greatest family day out we’ve had – doing anything – in a year. 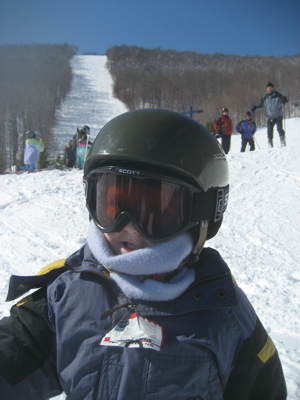 Posie got her ski legs back, Noel learned that his daddy will not to let him ski off the edge of a mountain, and Campbell got my undivided attention in the afternoon, when we took full advantage of Plattekill’s hefty coverage and headed off-piste. The sun was out, the snow was deep, and we decided to head in random directions, digging ever further into the woods, laughing as we went until we eventually popped out on one of Plattekill’s many steep double black diamonds. It was, we agreed, just like being in Utah – except, that is, for the cost. It’s not Utah – but for a couple of hours on February 21, Plattekill was just as much fun.